Join this semi-private small group shore excursion from Belfast Harbour. Visit amazing (UNESCO) Giant's Causeway before shopping and sightseeing in Belfast, Northern Ireland's premier city. Your vehicle seats no more than 25 passengers allowing for maximum comfort and interaction with the guide. 08:00 (or 30 minutes after docking for later arrivals). Your tour starts in style as you climb aboard a luxury small group van. Meet & greet with your driver and fellow passengers. Together we'll make our way inland through the beautiful Glens of Antrim. Our journey to Giant's Causeway takes us along the Causeway Coast, an area of outstanding beauty and characterized by cliffs overlooking white sandy beaches, world famous golf courses and on clear days – views of Scotland across the water. The highlight of the day is undoubtedly Giant's Causeway. 40,000 columns of hexagonal rock cascade spectacularly from the cliffs to the sea where they disappear before resurfacing on a Scottish island. In recent decades scientists have found that the structures were formed by volcanos some 60 million years ago. Although, we prefer the story of how the causeway was built in ancient times by the mythological giant Finn McCool. Join us on tour to learn the full story from locals in the know! You'll have ample time to explore this World Heritage Site with shuttle buses available for those who prefer not to walk up the steep slope to the Causeway (small charge payable locally). NB: Your (small group) ticket includes the £8 entrance fee for the Giants Causeway Visitor Centre (lunch may be had at the Visitor Centre or in a number of different towns depending on our departure time from the boat). 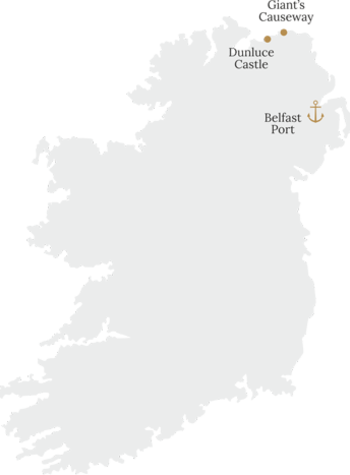 Before we turn for Belfast, we'll stop at the nearby Dunluce Castle. Due to time constraints there is only time for photos at the spectacular ruins but you'll have time to ramble around and get some great shots of the fortress crumbling from the cliffs into the Atlantic below. Ask your driver about the tragedy that befell the castle in the 1600s when the cliffside collapsed during a banquet and took many of the kitchen staff with it. This afternoon we'll return to Belfast well before the boat departs. Enjoy a sightseeing tour of Northern Ireland's premier city with highlights including Queen's University, Victorian City Hall, Prince Albert Memorial Clock, St. Anne's Cathedral and river Lagan. If your departure time allows you'll have time for extended sightseeing and shopping. NB: If your ship is leaving relatively early we will have to alter the itinerary to get everyone back on time. Normally cruise ships depart Belfast late- evening. If this is the case, you can expect to return to the boat after approximately 7 hours on tour. If the boat is leaving earlier we will amend the itinerary as necessary.